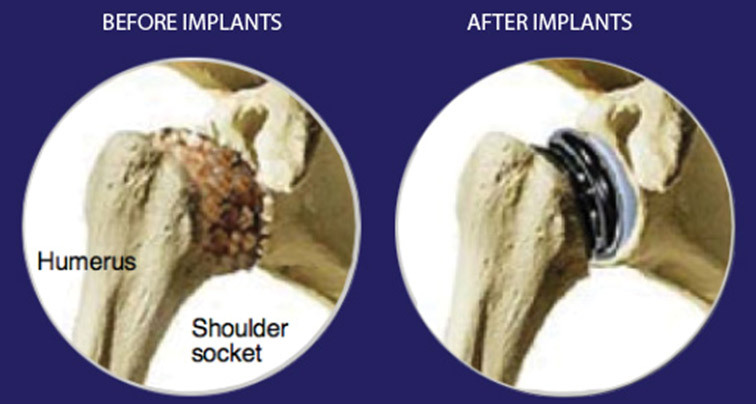 Shoulder Replacement - DOCJOINTS//DR SUJIT JOS//Total joint replacements with the best quality care at affordable price options at kochi, Ernakulam, Kerala, India / Knee, hip, shoulder, ankle, elbow replacement, Sports Medicine – Keyhole / Arthroscopy for Sports Injuries / cartilage preservation and cartilage regeneration techniques / minimally invasive subvastus / rotator cuff repair, biceps tenodesis, subscapularis repair, shoulder dislocation, bankart, Latarjet / Dr Sujith Jose is a renowned Orthopedic surgeon with vast experience in Joint replacement and satisfied patients from all around the world. Economical / budget knee done as special package price/ cartilage restoration, OATS, Ankle arthroscopy/ acl pcl mpfl meniscus repair/ wrist arthroscopy tennis elbow/ modular imported high quality operation theatre – Johnson & Johnson theatre with double lamina flow – The best care for your joint problems! 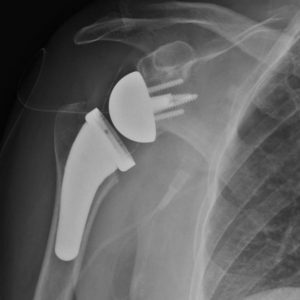 Total shoulder replacement arthroplasty is a well-established surgery for restoring comfort andfunction to the arthritic shoulder. In this procedure the arthritic ball is replaced by a smooth metal ball fixed to the arm bone (humerus) by a stem that fits within it. 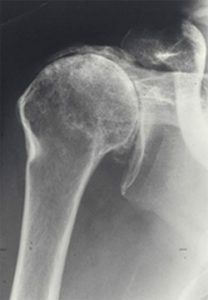 The arthritic socket (glenoid) is resurfaced with high-density polyethylene prosthesis. Among the different surgical options this procedure appears to provide the most rapid and complete improvement in comfort and function for shoulders with arthritis. Success requires technical excellence of the surgery and a commitment to the exercise program until the desired range of motion can be achieved comfortably. What Are The Key Parts Of The Normal Shoulder Joint? 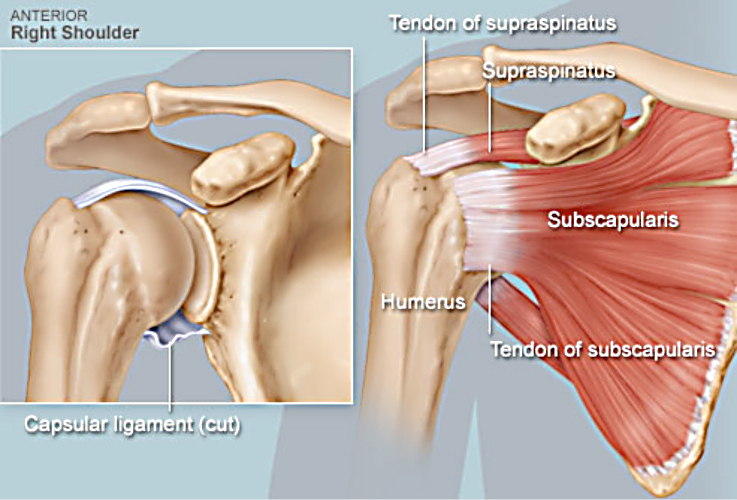 Shoulder arthritis is a condition in which degeneration, injury, inflammation or previous surgery destroys the normally smooth cartilage on the ball (humeral head) and socket (glenoid). Who Should Consider A Total Shoulder replacement? Surgery for shoulder arthritis should only be considered when the arthritis is limiting the quality of the patient’s life and after a trial of physical therapy and mild analgesics. Severe arthritis is usually best managed by either a partial or a complete joint replacement. 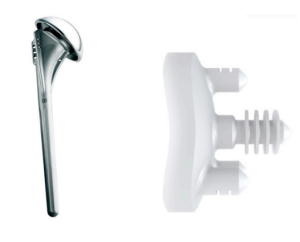 Total shoulder arthroplasty (replacing the surfaces of both the ball and the socket) is usually considered by individuals who want the best chance of a rapid recovery of shoulder comfort and the ability to perform activities of daily living. 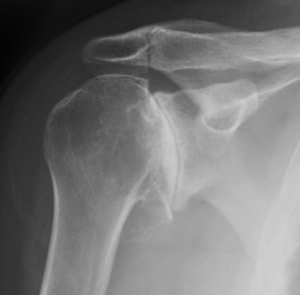 Carefully standardized X-rays reveal the loss of the space between the humeral head and glenoid that is normally occupied by cartilage, leaving bone on bone contact. What Is A Total Shoulder? 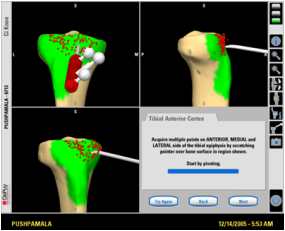 In a total shoulder, the arthritic surface of the ball is replaced with a metal ball with a stem that is press fit in the inside of the arm bone (humerus) and the socket is resurfaced with a high density polyethylene component. After a general or regional anesthetic, this procedure is performed through an incision between the deltoid and the pectoralis major muscles on the front of the shoulder. It includes release of adhesions and contractures and removal of bone spurs that may block range of motion. 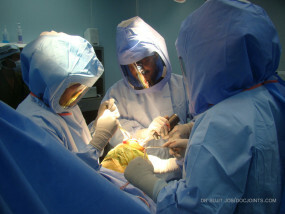 Our team of surgeons, anesthesiologists, and surgical assistants usually perform this procedure in less than two hours. 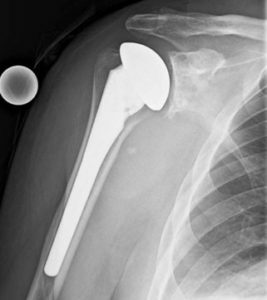 The arthritic surface of the ball is replaced with a metal ball with a stem that is press fit down the inside of the arm bone (humerus) so that only the smooth surface extends from the bone. How Is The Humeral Component Fixed In The Humerus? While some surgeons cement the humeral component and others use implants that foster bone ingrowth, we find that these approaches stiffen the bone making it more likely to fracture in a fall on one hand and greatly complicating any revision surgery that may become necessary in the future on the other. 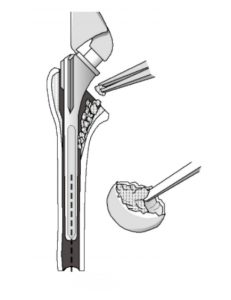 We prefer to fix the component by impaction grafting the inside of the humerus (using bone harvested from the humeral head that has been removed) until a tight press fit of the implant is achieved. 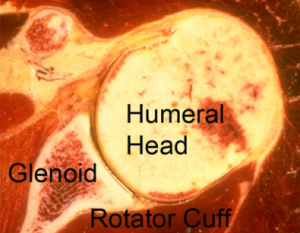 How Is The Glenoid Component Fixed To The Glenoid Bone? 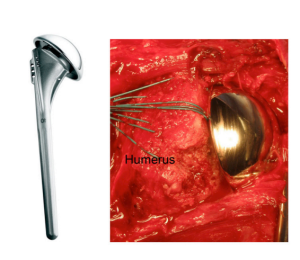 The bone of the glenoid is precisely shaped with a glenoid reamer and then the glenoid component is secured with a combination of press fitting and cementing. What is cuff tear arthropathy? 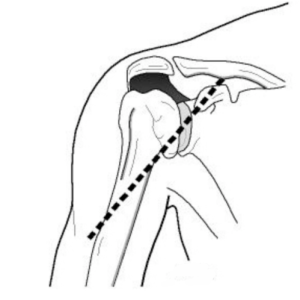 When arthritis of shoulder is associated with a massive rotator cuff tear, the shoulder ball will migrate upwards and rub onto the undersurface of the acromion and cause pain and inability to raise the hand up. This is treated with a special prostheis called Reverse shoulder replacement. 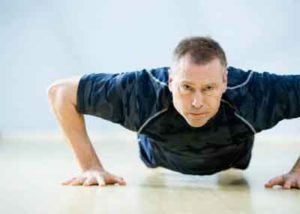 In order for proper healing to occur, the patient must maintain the range of motion achieved at surgery with simple, frequent stretching exercises. Rehabilitative exercises are started immediately after surgery using continuous passive motion and stretching by the patient. 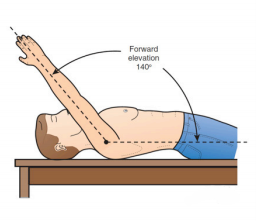 Attaining and maintaining at least 150 degrees of forward elevation is critical to the success of this procedure. The forward lean and the supine stretch can be helpful in getting there and maintaining this range of motion. Who Should Probably Not Consider A Total Shoulder Replacement? This procedure is less likely to be successful in individuals with depression, obesity, diabetes, Parkinson’s disease, multiple previous shoulder surgeries, shoulder joint infections, rotator cuff deficiency and severely altered shoulder anatomy. What Are The Keys To Success Of A Total Shoulder? How Does A Patient Prepare For The Total Shoulder Procedure? As for all elective surgical procedures, the patient should be in the best possible physical and mental health at the time of the procedure. Any heart, lung, kidney, bladder, tooth, or gum problems should be managed before surgery. Any infection may be a reason to delay the operation. Any skin problem (acne, scratches, rashes, blisters, burns, etc) on the shoulder or arm should be resolved before surgery. The shoulder surgeon needs to be aware of all health issues, including allergies as well as the non-prescription and prescription medications being taken. For instance, aspirin and anti-inflammatory medication may affect the way the blood clots. Some of these may need to be modified or stopped before the time of surgery. 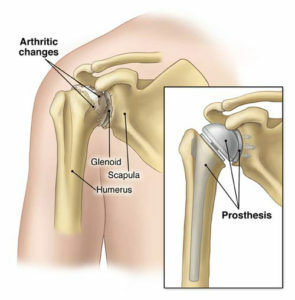 Total shoulder arthroplasty is a major surgical procedure that involves cutting of skin, tendons and bone. The pain from this surgery is managed by the anesthetic and by pain medications. Immediately after surgery, strong medications (such as morphine or Demerol) are often given by injection. Within a day or so, oral pain medications (such as hydrocodone or Tylenol with codeine) are usually sufficient. The shoulder rehabilitation program is started on the day of surgery. The patient is encouraged to be up and out of bed soon after surgery and to progressively reduce their use of pain medications. Hospital discharge usually takes place on the second or third day after surgery. Patients are to avoid lifting more than one pound, pushing and pulling for six weeks after surgery. Driving is recommended only after the shoulder has regained comfort and the necessary motion and strength. This may take several weeks after surgery. Thus the patient needs to be prepared to have less arm function for the first month or so after surgery than immediately before surgery. For this reason, patients usually require some assistance with self-care, activities of daily living, shopping and driving for approximately six weeks after surgery. Management of these limitations requires advance planning to accomplish the activities of daily living during the period of recovery. Early motion after a total shoulder replacement is critical for achieving optimal shoulder function. Arthritic shoulders are stiff. Although a major goal of the surgery is to relieve this stiffness by release of scar tissue, it may recur during the recovery process if range of motion exercises are not accomplished immediately. For the first 6 weeks of the recovery phase, the focus of rehabilitation is on maintaining the motion that was recovered at surgery. Strengthening exercises are avoided during the first 6 weeks so as not to stress the tendon repair before it heals back to the bone. 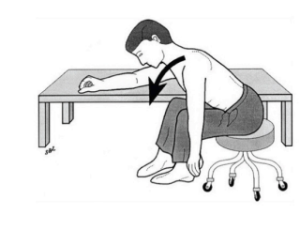 Later on, once the shoulder is comfortable and flexible, strengthening exercises and additional activities are started. Some patients prefer to carry out the rehabilitation program themselves. Others prefer to work with a physical therapist who understands the total shoulder program. When Can Ordinary Daily Activities Be Resumed? 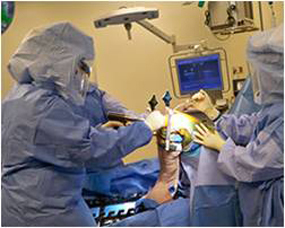 In general, patients are able to perform gentle activities of daily living using the operated arm from two to six weeks after surgery. Walking is strongly encouraged. Driving should wait until the patient can perform the necessary functions comfortably and confidently. Recovery of driving ability may take six weeks if the surgery has been performed on the right shoulder, because of the increased demands on the right shoulder for shifting gears. With the consent of their surgeon, patients can often return to activities such as swimming and golf at six months after their surgery. Once A Shoulder With A Total Shoulder Procedure Has Successfully Completed The Rehabilitation Program, What Activities Are Permissible? Once the shoulder has a nearly full range of motion, strength and comfort, we recommend that the shoulder be protected from heavy lifting loads and from impact. Thus we discourage chopping wood, training with heavy weights, vigorous hammering, and recreational activities that subject the shoulder to impact loading. 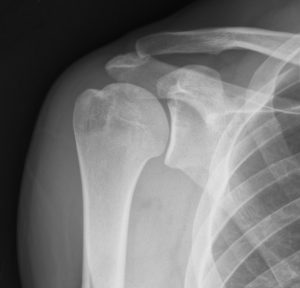 What Problems Can Complicate A Total Shoulder And How Can They Be Avoided? Like all surgeries, the total shoulder operation can be complicated by infection, nerve or blood vessel injury, fracture, instability, component loosening, and anesthetic complications. Furthermore, this is a technically exacting procedure and requires an experienced surgeon to optimize the bony, prosthetic and soft tissue anatomy after the procedure. The procedure can fail if the reconstruction is too tight, too loose, improperly aligned, insecurely fixed or if unwanted bone-to-bone contact occurs. The most common cause of failure in the short term is a patient’s inability to maintain the range of motion achieved at surgery during the healing period, which can last up to six months after surgery. 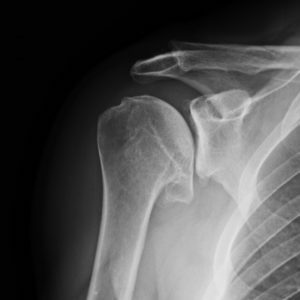 The most common long-term problem is wearing or loosening of the glenoid component.